A Memorandum of Undertaking (MoU) was signed between the Indian Army and HDFC Bank on the Defence Salary Package on 03 Apr 2018. 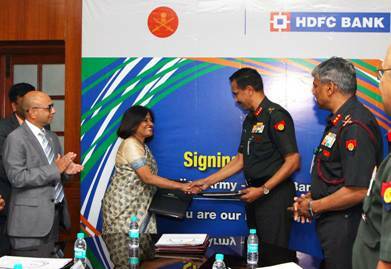 The first MoU between HDFC Bank and the Indian Army was signed in 2011 and was renewed on 13 Mar 2015. The current MoU is tailor made to suit the requirements of serving soldiers, pensioners and families. The signing in ceremony was chaired by the Director General (MP&PS), Lt Gen S K Saini and was attended by the top dignitaries of HDFC Bank headed by Ms Smita Bhagat, Head Government Business and Branch Banking. Currently Indian Army has MoUs on Defence Salary Package with 11 public and private sector banks. MoUs are considered for inception and renewal with banks on analyzing their utility and suitability to the requirements of serving soldiers, pensioners and families. Army is hoping that this MoU will benefit a large number of serving and retired Army personnel who are having their accounts with HDFC bank; and also provide them an opportunity to access modern banking facilities. some months or nearly 2 years ago there was an govt. order from DOPT that new pensioners should not choose HDFC bank. Now govt. changed. I hope that order will also be changed.